ITF-14 Barcode Creator Add-on from RasterEdge DocImage SDK for .NET owns mature and advanced ITF-14 barcode drawing functions for C#.NET image processing and document manipulating applications. Our C#.NET ITF-14 barcode creating control is competitive on the market for generating 1D ITF-14 barcode on the supported image and document formats, such as Jpeg, Jbig2, Png, Gif, Bmp, TIFF, PDF, Word, Excel and PowerPoint. Specific benefit list of ITF-14 barcode generating in C# class is listed below. You can easily generator ITF-14 barcode and save it to image files/object using this C#.NET barcode generator control. The following steps will show how to create a ITF-14 type barcode encoding numeric data text "0123456789012" into the image object with XImage.Barcode.Creator. Please copy the sample code as follow to generator a ITF-14 barcode. This C#.NET barcode generator dll supports users generating & inserting ITF-14 barcode at specified area of Png, Gif, Jpeg and Bmp images by using C#.NET class code. In addition, users are able to set all ITF-14 barcode properties to generate a satisfactory ITF-14 barcode image. Using this ITF-14 barcode creator add-on for C#.NET, users can select a page from multi-page document file and generate a standard ITF-14 barcode at a specified area of that selected page within C#.NET class application. The supported document files are PDF, TIFF, Word, Excel and PowerPoint. What's more, if you want to personalize ITF-14 barcode image, you are able to adjust the barcode parameters to your desired values. Main relative parameters include: ITF-14 bar module width & height, barcode width & height, multiple margin data, barcode fore & back color and font style. 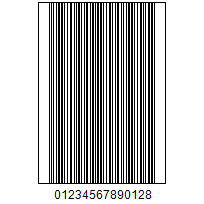 Following C# sample code is used to generate a standard ITF-14 barcode on a png image file. From the C# code, you can find many ITF-14 barcode imaging-related parameters, which are free to be adjusted to meet your own ITF-14 barcoding requirement.